Overactive bladder disorder (OAB) is a debilitating condition which can result in embarrassment and social isolation. It can restrict activities and impact many aspects of life. Many sufferers do not seek treatment because they think overactive bladder dysfunction and urinary incontinence is a normal consequence of ageing. However, treatments are available for men and women and can result in a significant improvement in quality of life. Overactive bladder disorder occurs when the bladder muscle contracts without permission. This may create a sense of urgency or even urge incontinence. Urgency: the sudden urge to pass urine which is difficult to ignore. Nocturia: waking up more than once at night to pass urine. 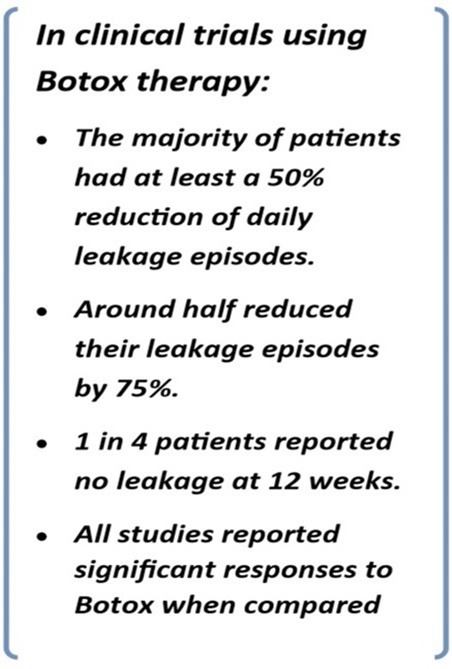 Incontinence: leakage of urine that you can’t stop. Urge incontinence: leakage accompanied by or immediately preceded by a sudden feeling of urgency. Overactive bladder disorder involves contraction of the bladder muscle at the wrong time resulting in urgency, frequency and urge incontinence. The above symptoms can coexist with other bladder conditions: in women, especially stress incontinence. It is important to manage both conditions. For the management of stress incontinence weight loss, pelvic floor training and minimally invasive sub urethral sling surgery is available. For some patients urodynamic testing is necessary to achieve the best outcome for bladder control. This is a sophisticated diagnostic procedure that enables precise diagnosis of the causes of bladder symptoms. This study takes half an hour and involves the passage of a small computer probe through the urethra into the bladder to measure bladder pressures and to detect bladder contractions. 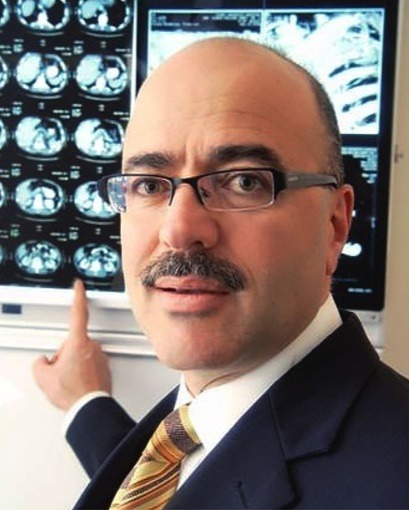 Urodynamic testing and non-anaesthetic flexible cystoscopy are performed by Dr Katelaris in the urology outpatient clinic at Palmerston Road, Hornsby. Conservative therapies such as bladder retraining are effective for many women. This involves drinking 2 L of water per day and progressively deferring bladder emptying for longer and longer periods of time. The normal adult bladder should hold comfortably 500 mL for a period of 4 to 5 hours. Minimising caffeinated drinks also helps. Pelvic floor training is an important part of treatment. It aids with stress leakage of urine and for women with urinary urgency, helps to suppress the bladder contraction that results in urgency and even urge incontinence. There are a number of modern medications that are proving very effective for the management of OAB. 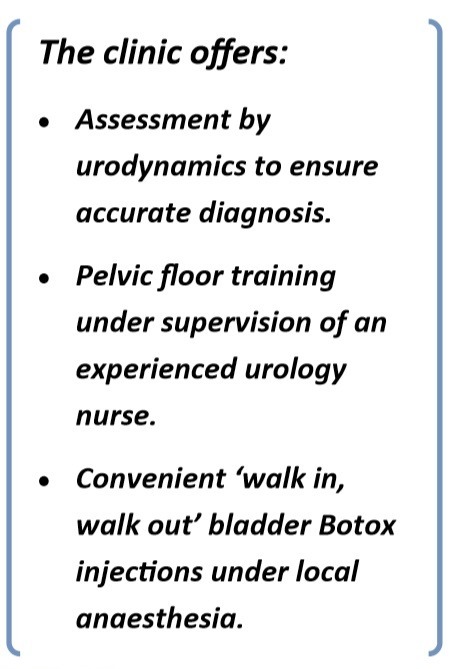 These should be trialled as first-line therapy for urinary frequency, urgency, and urge incontinence in concert with bladder training programs. Botox is injected into multiple sites throughout the bladder and prevents the bladder muscle from aberrantly contracting. For people whose bladder condition does not respond to bladder training, pelvic floor exercises, or oral medication, Botox bladder injection therapy should be considered. Botox therapy works by reducing the ability of the bladder muscle to contract by interfering with the chemical signalling between nerves and muscles. The Botox medication is injected directly into the bladder muscle under local anaesthe tic by the passage of a small telescope into the bladder. One injection of Botox into the bladder muscle may be effective for between 6 to 12 months. A comprehensive bladder program is offered at the Bladder Botox clinic following assessment by an expert urologist, Dr Phillip Katelaris. The clinic offers sophisticated urodynamic testing and non-anaesthetic flexible cystourethroscopy when indicated, bladder training and training in pelvic floor exercises with specialist urological nurse, Mrs Libby King. Should Botox therapy be required, a walk-in walkout model has been developed for patients to undergo the procedure under local anaesthetic. Patients are able to drive home after the procedure.